The major genre event of the week was the much anticipated premier of Legion. After watching the pilot, I would say it is worthy of the hype. If it can maintain this quality, it would rank with Jessica Jones, and possibly surpass it as the best superhero show ever. Created by Noah Hawley of Fargo, the show will also hopefully receive a cross over base of fans from those who watch quality television, even if they have not watched superhero shows in the past. At the Television Critic’s Association Winter tour, we talked more with Hawley about how closely he hewed to the Marvel X-Men universe when crafting the series, the aesthetic of the series and how he narratively framed the eight-hour first season. Legion has a very distinct, retro, out-of-place vibe to it. Why go with a vague visual setting for the series? These latest X-Men movies take place in the ’60s, ’70s and ’80s, so there is a period-ness to the movies. By hiding the period [in the series], the question is more open-ended and it allows us to prove ourselves and stand on our own two feet. With the first year of Fargo, for the first three hours there was no connection to the movie at all so the audience felt it was working on its own. Then in the fourth hour, we introduced the money from the movie and suddenly it was connected. But by that point we had earned the right to be judged on our own merits. Was there any burden to look to Marvel comic or even recent X-Men film mythology to construct this series around? Do you apply any of the ‘rules’ of the universe? What’s been freeing about writing a genre show? How did you construct the series, as in will there be a cliffhanger to end the season like the comics or films might do, or is this self-contained storytelling? It ends a chapter. Even though it’s a recurring series, and not a limited series, there is a beginning, middle and end to the first season, and there would be to the second season as well. I think it’s important to think of them in that way. Everyone give a warm welcome to Niffin Alice. Knowing that his girlfriend is essentially gone (niffins don’t have those pesky consciences, or even souls really) Quentin makes the impossible choice to set his keiko demon on her to make sure she isn’t set loose on Fillory. Naturally, we asked the cast whether we should really accept that Alice is dead and gone. Jason Ralph’s answer was at least a little encouraging, since apparently Alice & Quentin might not be totally done with each other yet. It sounds like even though Alice is dead, we might be seeing a little more of her through flashbacks, visions, or even as a ghost. At least we can take heart knowing that we’ll see some version of her from here on out. E! News: At what point did you know we were saying goodbye to Alice this season? Dudley: I knew eventually Alice was going to die, because I mean I read the books, and it happens in the books. I didn’t know going into the series when it would happen, and neither did John [McNamara] and Sera [Gamble], our showrunners. We talked about it and knew it wasn’t going to happen in the first season, so I assumed it was going to happen in the second season, but didn’t know until we got up to Vancouver and started shooting that we had the conversation that it was going to be in the third episode. And I think it’s so important to the story, and it’s a huge part of Quentin’s journey from here on out, and the heartbreak of that, so I knew that it was important. As much as I didn’t want it to happen, I was excited to get a chance to have that moment, because it was my favorite part in the books when Alice battles the beast and dies. It was such a cool moment at the end of last season when Quentin realized Alice was really the “chosen one” who needed to kill the Beast. Did that have a big impact on you, especially knowing it was leading to this heroic death? That’s very exciting to get to play that. In that scene, when Quentin says you’re the hero, you’re the one, I think it’s really hard for Alice to digest. For me, it was so exciting to get to play the hero at the end, and you know, Alice has so many issues and it takes a really long time for any of them to have any kind of growth on the show, but under the surface, I think that it’s hard for her to swallow that she’s the one, she’s the chosen one. I love that in books and movies, like Lord of the Rings. I loved that character that gets to be the chosen one whether or not they wanted to. She wasn’t seeking this in her life, and to get it thrust upon her and force her to be great is, I think, really beautiful. 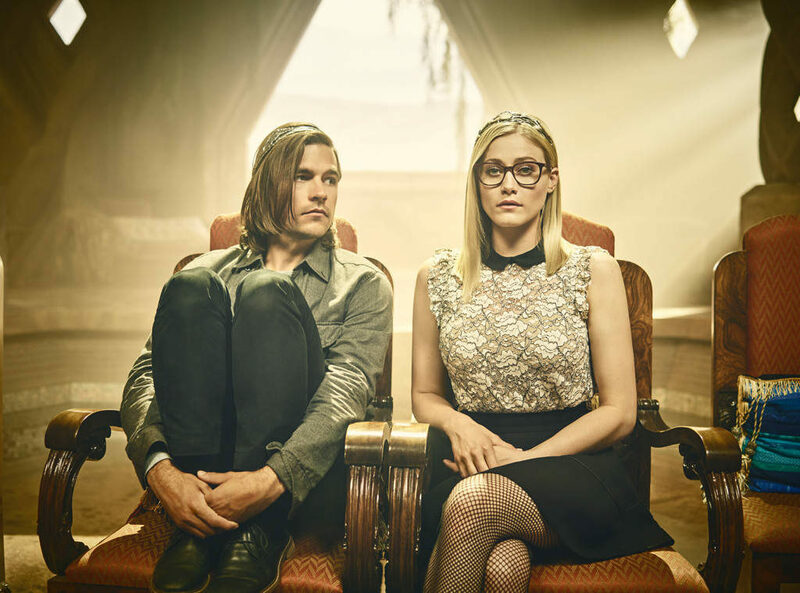 The Verge took a look at the entire series in an article entitled, The Magicians builds a better fantasy show by bringing realism to magic. 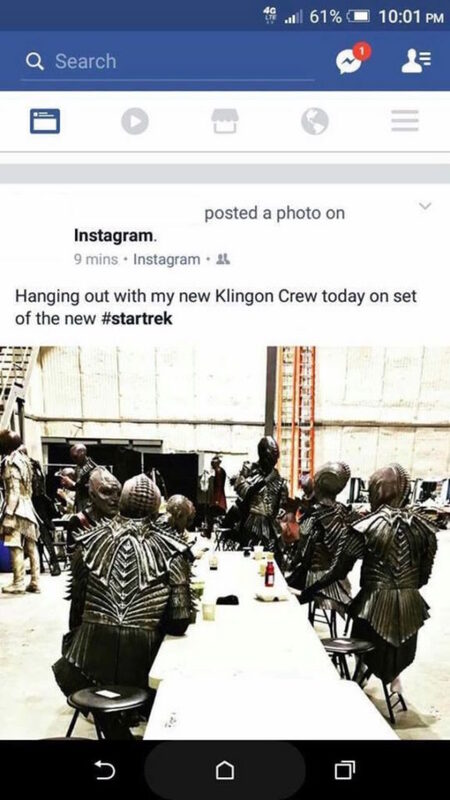 With Star Trek: Discovery taking place before The Original Show, there has been speculation as to whether the Klingons will return to their original look or have the ridges as on later series. We got the first answer in the picture above. The cast of Stranger Things is on the cover of Entertainment Weekly, with some hints as to what happens next season. Showcase has renewed Travelers for a second season, with it to also be available in the United States on Netflix. Netflix has also renewed The OA and Love. Set photos suggest that the Supergirl/Flash musical cross over episode will take place in the 1940’s. 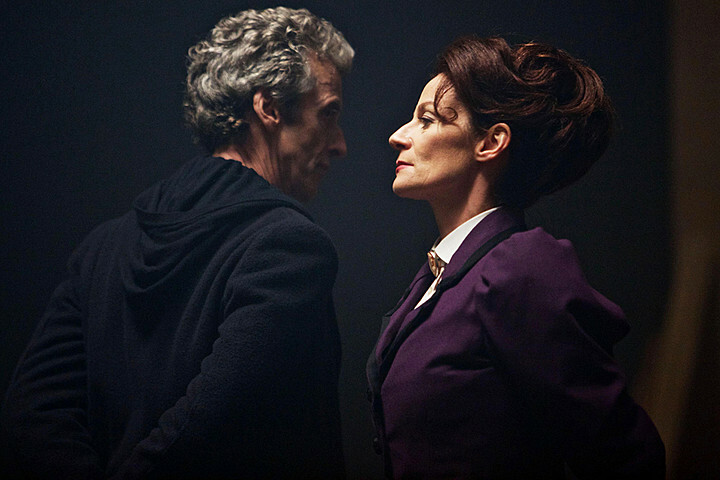 The BBC has confirmed that Missy will be returning on series 10 of Doctor Who. The fifth and final season of Orphan Black will premiere on June 10. Sarah Shahi of Person of Interest will be appearing in another genre show, Reverie. The NBC thriller deals with virtual reality. We might need a show as absurd as Veep to make any sense out of the Trump White House. Fortunately the show will be returning on April 16. Richard Hatch, who stared in the original Battlestar Galactica and also had a role in the remake, died last week of pancreatic cancer. Al Jarreau, a Grammy Award-winning singer whose versatile tenor voice and vibrant stage style blurred the lines between jazz, soul and pop music, died Feb. 12 at a Los Angeles hospital. He was 76. His publicist, Joe Gordon, announced the death, saying the singer had been treated for exhaustion, after announcing his retirement from touring last week. The cause of death was not immediately known. Mr. Jarreau was loosely classified as a jazz singer, but his eclectic style was entirely his own, polished through years of obscure apprenticeship in lonely nightclubs. He did not release his first album until 1975, when he was 35, but within two years, he had won the first of his seven Grammy Awards and had begun to attract a wide following. Yesterday I looked at very early discussions from pundits and pollsters regarding the 2018 Congressional elections. It is far too early to say what will happen, but at least there is old data correlating presidential approval ratings and changes in seat in the midterm elections. 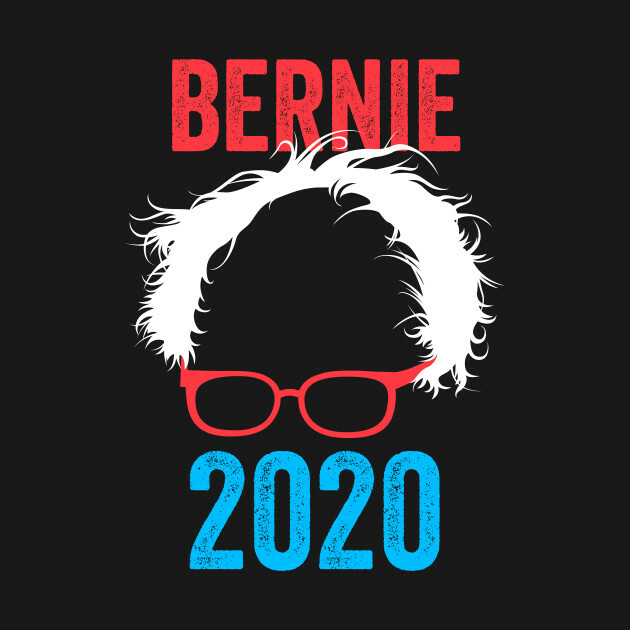 There are also pundits with way too early predictions as to the 2020 presidential elections, including one predicting that Hillary Clinton will not only run again, but win the Democratic nomination. Fortunately any predictions made today have a good chance of not coming true. Trump’s chief strategist, Steve Bannon, asked consultants to scour the backgrounds of four outspoken Democrats — Ohio Sen. Sherrod Brown, Connecticut Sen. Chris Murphy, Colorado Gov. John Hickenlooper and Dallas Mavericks owner Mark Cuban, two sources close to the administration said. Both Murphy, a freshman senator who has lambasted Trump’s immigration orders, and Brown, a 10-year Senate vet who made Hillary Clinton’s VP short list, are seen as viable threats who can quickly raise money and build a network of supporters, the sources said. Hickenlooper, who founded a brewery before becoming governor of the Western swing state, is seen as a less-combative rising star, the sources said. But the White House’s “biggest fear” is that Cuban, a billionaire businessman, would run because he can appeal to Republicans and independents, the sources said. This could be one reason that Trump is attacking Cuban, not that he needs any reason to attack anyone who has been critical of him. Making predictions based upon age is risky, but reportedly they have eliminated not only Bernie Sanders but Elizabeth Warren as possibilities due to being too old. They eliminated Kirsten Gillibrand, believing she is too young. The Post also says, “Trump’s political team is also counting out Cuomo and New Jersey Sen. Cory Booker, because they’ve been tainted by corruption probes.” The nomination of Hillary Clinton in 2016 showed that being tainted by corruption might not be a disqualification. Hillary Clinton has 100 percent name ID, a personal fortune and a bastion of loyalists. She could enter the race at the last possible moment—at the behest of the people, of course—and catch her Democratic Party rivals by surprise. To soften her reputation as a programmed, overly cautious and polarizing figure, Clinton should eschew the front-runner label and run as an underdog, praising the other candidates and their proposals, opening up her campaign bus to the press corps and offering to have a freewheeling debate with any major rival, at any time, and anywhere. It is possible she could win again, especially if their is a divided field without a clear front runner as he predicts, but based upon Clinton’s past I doubt this is what she will do. If she wants to run, her first instincts will be to once again try to clear the field and start running early with claims of inevitability. Opening up to the press corps is the last thing Hillary Clinton would feel comfortable doing. She will continue to oppose liberal views which are far outside of her comfort zone. She certainly does not want to agree to frequent or freewheeling debates. Clinton knew exactly what she was doing when she tried to get the DNC to set a limit of four debates (with the DNC agreeing to limit it to six). Postponing the first debate until fairly late in the cycle made it harder for other candidates to establish themselves. Initially, due to her long experience in politics, she did dominate the debates. However, as Sanders developed experience in debating her, and the fact checkers reviewed her falsehoods, the debates turned against her, such as before the Michigan primary (which foreshadowed her general election loss). If there had been multiple debates starting earlier in the process, I doubt Clinton would have won the nomination. Regardless of whether Clinton can win the nomination, I hope that Democrats have learned their lesson after loses in 2010, 2014, and 2016. Running as a Republican-lite party does not work. Democrats need to run their best possible candidate in 2020, not one so weak that she could not beat Donald Trump. It is especially important for Democrats to regain control of some of the state legislatures they have lost prior to redistricting in 2020, and a weak candidate on top of the ticket will make this more difficulty. Even if Clinton could win, after Trump we do not need a conservative DLC-type Democrat and neocon in the White House.